If you’re a fan of spicy food, you’re going to dig this smoothie recipe. When I first heard someone advocate adding spices like cayenne and chili powder into a smoothie I thought it sounded rather strange, but I had to give it a try. Fast forward to today, and I routinely add spices into my smoothies. Some of my favorites are cinnamon, ginger, cayenne, and nutmeg. Adding spices is a super easy way to enhance the taste and boost the nutrition of your smoothies. Remember, when brainstorming what to add into your smoothie to change it up, nothing is off limits, unless of course it’s unhealthy. This particular recipe calls for cayenne pepper and/or chili powder. 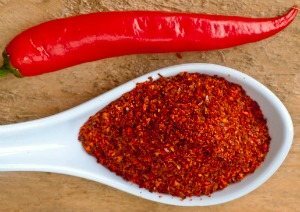 Cayenne pepper is a ground red, hot chili pepper that’s hotter than chili powder, which is a mix of cayenne, ground chili peppers, cumin, garlic, and oregano. A pinch of cayenne pepper goes a long way so be careful not to over do it. Place all of the ingredients into your high speed blender and blend on high for about 30 seconds until smooth. I’d love to hear if you tried this spicy spinach smoothie recipe; so please leave a comment below. Happy Blending! I don’t know what i was expecting, but this turned out to taste really good!